Hit the road in style with the iconic Mike's Auto Garage from Le Toy Van. Finished in a colourful chevron and chequered flag motif, the stunning Mike's Garage has a retro feel to it, but it's also full of modern advances, including a patrol pump, a helicopter pad, and a working winch car lift. 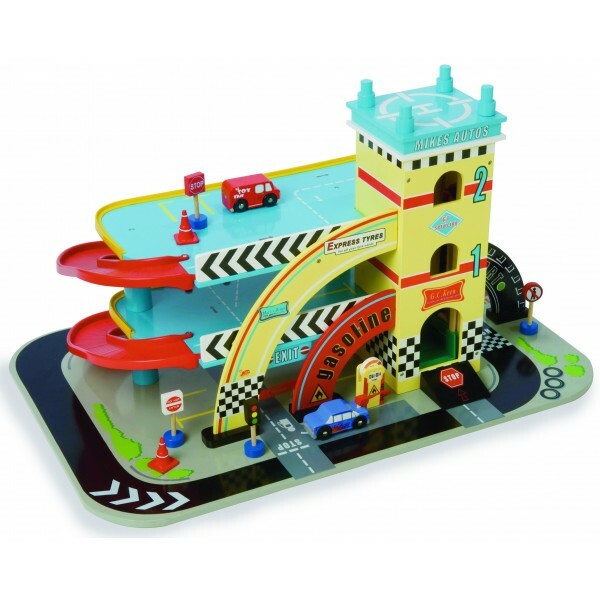 With three floors, as well as two spiral ramps, four assorted road signs, four traffic cones, and two vehicles all included, this is a fantastic toy that's fast become the benchmark of excellence in role play garages. This is a brilliant Garage set, with loads of play value and lots of attention to detail - little drivers absolutely love the car lift! The two cars provided move freely down the ramps, so there's action as well as imagination with this set.